Micro Sanding Wands are economical, versatile tools that use 1/4 inch wide, abrasive belts for smoothing miniature components and hard-to-reach areas. Made of tough, impact resistant polypropylene with a spring loaded tensioning device that keeps the abrasive belt firmly in place, plus allows a quick change when a new belt is needed. Belts can be rotated a full 360 degrees so they can be used completely. Micro sanding wands can be used wet or dry and work well on almost any material, and they're color coded so you can identify different grits instantly. 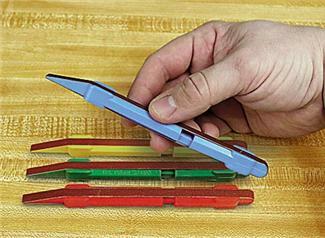 4-piece Micro Sanding Wand Set includes: Yellow, 400 grit; Green, 320 grit; Blue, 240 grit; Red, 120 grit. Click the button below to add the Micro Sanding Wand Set to your wish list.